Representation of the invention team's face detection and analytics system. In the past decade, it seems that facial recognition software has begun to show up everywhere that there is technology. Crime dramas laud face recognition as one of the most important tools for catching criminals, Facebook recognizes your friends in your photos and suggests you tag them, and even some smart phones can be unlocked using facial recognition instead of a password. However, facial recognition software is not always accurate and is particularly prone to producing false positives, making it unreliable and problematic for widespread adoption in fields such as security and law enforcement. However, University of Maryland (UMD) researchers have recognized the vast potential for facial recognition software adoption in many industries and have invented a new Robust System for Large Scale Facial Verification and Search. The new software uses deep convolutional neural networks, artificial networks inspired by biology which are used to analyze visual imagery, to analyze huge databases of photos and collect detailed data about each face. The software can identify features such as the gender and age of the subject as well as their pose and fiducial points, markers used as points of reference to measure subjects in photographs. By using these deep learning networks, the researchers were able to produce vastly better results than with previous software. “Our software for facial verification yields exceptionally high levels of performance in terms of accuracy, which is greater than ninety percent, at false alarm levels as low as one in a million,” said Ramalingam Chellappa, Distinguished University Professor and Minta Martin Professor of Engineering and chair of the Department of Electrical and Computer Engineering at the A. James Clark School of Engineering. The software was invented by: Rajeev Ranjan, graduate student with the UMD Institute for Advanced Computer Studies (UMIACS) at the College of Computer, Mathematical, and Natural Sciences; Carlos Castillo, assistant research scientist at UMIACS; and Chellappa. The team’s research was funded by the Intelligence Advanced Research Projects Activity (IARPA) Janus Project. The team envisions their invention being applied to many fields, including homeland security, human-computer interaction, secure online shopping, and smart phone and tablet security. 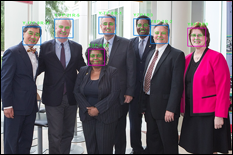 Mukh Technologies, a spinoff company founded at UMD, is commercializing the face analytics software developed under the IARPA JANUS Project. The “Robust System for Large Scale Facial Verification and Search” has been nominated for the Invention of the Year Award in the information sciences category, for which the winners will be announced at the 2018 Innovate Maryland celebration on April 11. UMD is ranked among the top ten best values in the nation by Kiplinger's 100 Best Values in Public Colleges.